MarathonMan wrote: Ah I see. And I rescind my comment - I can debug it; I'll just have to debug it in a headless mode. tl;dr: on the TODO list it goes. Really impressed with the spike in progress lately. Getting 90 VI/s on my 6600K. We may need a frame limiter now. By the way, what's with the messed up lighting in Super Mario 64? Some things are way darker than they should be. Probably a known issue by this point, but I would still like to know. MarathonMan wrote: The real performance boosts will come with the next core/dynarec. The current situation is more or less in holdover-mode and most benefits will probably end up coming from new GCC versions. Dynarec in a cycle-accurate emulator? Can't wait to see that. This is a ROM hack of Super Mario 64, and I don't know how it runs on console since I don't have a flash cart or even an expansion pak, but in M64P, it works just fine. MarathonMan wrote: Can you `rm -f cen64 && make VERBOSE=1` and pastebin? Doesn't fail until linking, so I only copied everything below the linking stage. I can't seem to compile CEN64 ever since you merged the X11 stuff. No idea why. Am I missing any dependencies? 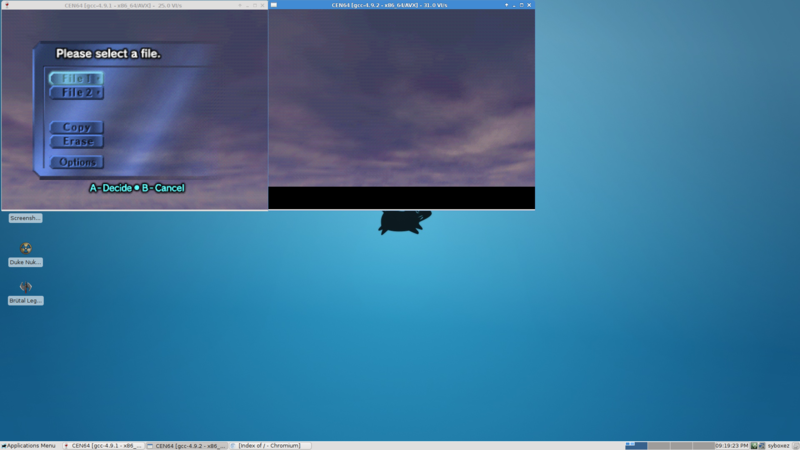 An OpenGL implementation of angrylion's RDP that's cross-platform. Think it could be useful? This did not work on my AMD E-350 APU back when I tried it 4-9 months ago. Works for me in Windows 8.1. Guess it will be a while until CEN64 is truly indistinguishable from a real N64. MarathonMan wrote: Try again -- I disabled the optimization that should be responsible for that. The Windows x64 calling convention allocates fewer volatile registers so this is less likely to happen with that optimization enabled. Majora's Mask works fine on the Windows build (with WINE), but not on the Linux build (my own build, but I've also tried the SSE4.1 build). Lot's of flickering, no UI in the menu, no Nintendo text (although the spinning 'N' shows up). I just kept mashing X and Enter and I started the game. Honestly, I wasn't expecting it to work at all. You could always just go the libretro route and not worry about Windows, then again, I have no experience with that API. Snowstorm64 wrote: Also you might want to enable VR4300_BUSY_WAIT_DETECTION in the build options. That just boosted me up to 45 VI/s in game (60 at menus). Lolwut? Just built it on my 3570K. Getting around 30 VI/s. Also 52 in Dig Dug (Namco Museum), which is up 6 VI/s from the last time I built. Impressive. EDIT:And adding on what MarathonMan said in the post above, cen64-qt converts n64 to z64, which is unbyteswapped. Sorry. I didn't realize just how early in development the new core is. Installed native Linux. Now it runs, but there is no picture. I really want to see it since it's reporting ~56 VI/s. Tried with Majora's Mask, Super Mario 64, and Ocarina of Time. MarathonMan wrote: What ROMs are you trying? As mentioned above, few work with the new core. Super Mario 64 and Ocarina of Time. EDIT: Actually, scratch that. I think it's because I'm running in VirtualBox. "libGL error: failed to load driver: vboxvideo"
I'm trying to do a release build. I'm going to try again in Windows, but I have no idea why it's failing in Linux.